Over the past couple of weeks, I published my personal reviews about Module 1 and Module 2. Let’s continue and move onto Module 3! Welcome to Module 3 feedback! If you make it module 3, you will start to see improvements coming your way. I started module 3 with evening classes (3.1) and finished it with day classes (3.2). Classes were not as crowded as during the earlier modules, which was really nice. I could see also a change with who is attending the classes. There were less students and more professionals with a great dedication and motivation at each class! Grammar is still a big part of this module as we need to be reminded of it and get better at it! Module 3 includes a lot more talking in small groups, which will substantially help your talking. The teachers only speak Danish during the class, which is really helpful and forces you to think in Danish and process it faster when wanting to talk. Volunteering in Denmark, hospitals and accidents, health, Modern life and stress, writting emails, writting comments as if you were a user reading an online forum post, a famous person you admire and why, being vegetarian, etc. We read also one book every week, which we had to sum up in a resume, as well as introducing it to the other students in the class. Some books were thrillers, drama, biographies of Danish authors, poets or painters, or just everyday stories. The books are more interesting than module 1 and 2, but by the end of module 3, they get a bit boring. Module 4 books are definitely more interesting. I really liked being able to discuss (in Danish) what we read and share my thoughts on it. Besides, you get a correction of your resume, (from the teacher) which will help you improve in grammar. During module 3, we had to listen to audio files/watch videos and answer questions. We also had to transcript audio files, which will improve your understanding. Here is an example of an audio file we had to listen to and use for questions. Check out the lyrics (if you want a bit of help). We also listened to Danish songs, trying to guess the text and get used to it. This really helps your understanding and will add vocabulary (I previously wrote a post about listening to Danish songs, here is the post). During module 3.2, our teacher started to have us watching a very famous TV series called Matador. This was online on DR, with subtitles. I wrote a full post about it, which was “The Matador Challenge“! I would definitely recommend you to check it out and try include it in your studies. It really helped us with understanding Danish. Module 3 is split into 2 levels: Module 3.1 and Module 3.2. Pronunciation, expressions, grammar (inversion especially), verbs, tenses, conjunctions, expressing your opinion with more expressions and sophisticated vocabulary (compared to what you learnt in the modules 1 and 2). The teachers will only speak Danish, which is really great! You will be discussing topics that are more complex and that relate to the Danish society. Module test 3 only includes two parts: reading and written. Please note that you are allowed to use a Danish/English dictionary during the test. You will need to be very consistent throughout the module and make sure to learn all the new vocabulary and expressions between each class. I personally managed to learn approx 600 new words/expressions during this module, which made my level in Danish that much better. It wasn’t easy to be honest, but this really paid off from module 4. Here is an exercise that we were given in class to be prepared for module 3 test. Try to do it at home, this is the type of written test you can have for module 3 (give yourself max 25 min to do it). In all honesty, the time given is really sufficient and you will have many chances to proof read what you will hand over. Do not stress yourself too much for the test. The module 3 prepares you very well for the exam, thanks to the various written homework. There are many great books used by the various schools to learn Danish. 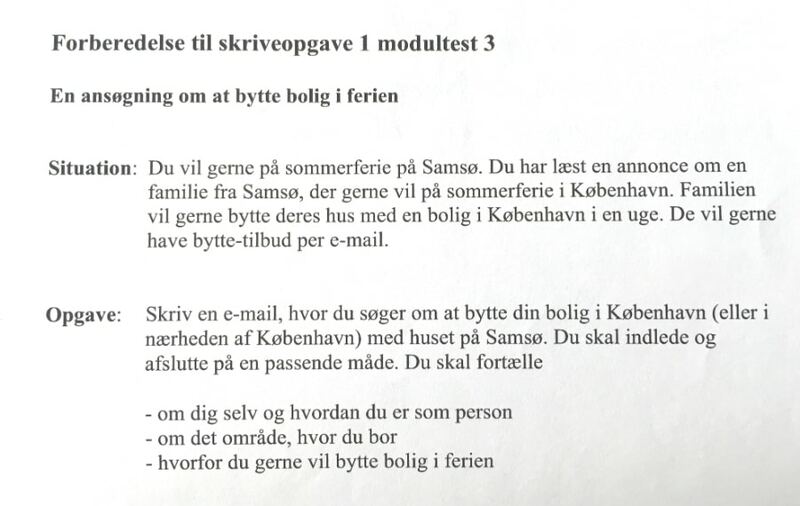 The one my teacher used during module 3 was called “Det Kommer!”. I really like this book, because it was very well structured and included an exercise book. I could definitely feel that the texts were more complicated, which helped me improve a lot more. Resources and my everyday routine. Module 3 has been a great learning curve and I personally improved a lot during this module. I enjoyed that the teachers were only talking Danish to us, but that we also spoke Danish to each other during the classroom. This helped me get more confidence and just go for it. I really enjoyed reading more books on topics that are more complex, but also being able to learn more about Danish society, culture and history. I cannot recommend it enough, but read as much as you can, this will help you. During module 3, I managed to learn a lot of vocabulary which helped me read, understand conversations and also have more structured conversations. I felt that I could take more “risks” and trying my best to talk to Danes. You will start noticing some changes by the end of module 3. As described above, we also started to watch series and documentaries, which really pushed my level in Danish. Hang in there, module 4 will only start to get better and so will be your Danish level! Full comprehensive review of module 4 coming out next week. Stay tuned! What did you think about module 3? Did it meet your expectations? Great review! I am about to take the module 3 test on Monday and feel so ill prepared. Nice comments, but none of the content you show matches my school. I am sure the teaching materials are different at each school. But I do think the testing levels are standardized by the government. At my school, the emphasis is much more on pronunciation, and it really helps my ability to speak and be understood by Danish friends. Thank you for your message. Which school are you attending? You are right, every school/teacher has its own methods and materials. Ultimately, we all go through the same exam at the end of module 5 (PD3). Thank you for the comment Talya 🙂 Hope you are all good! Module 3 did not have an oral part when I took it (June 2017). I doubt it changed since last year, but better double check with your teacher. Module 4 test is a bit similar to Module 2 however tougher. Tak for din feedback. Jeg har ligget artikler omkring PD3 eksamenen her. Kig på dem, det kan sagtens hjælpe dig før eksamen. How long did this module take you and how many hours per week did you attend class? Thanks for the review! Thank you for your message. Module 3 took me 12 weeks, with 12 hours per week. I was taking day classes (3 times x 4h). If you do evening classes you will spend less hours, but normally, same amount of weeks.